We're probably just a month away from the official unveil of the next Pixel family, Google's upcoming Android smartphones, and new information has just been uncovered via Geekbench. It looks like the slightly larger Pixel smartphone, also known as Marlin, has been spotted at Geekbench. 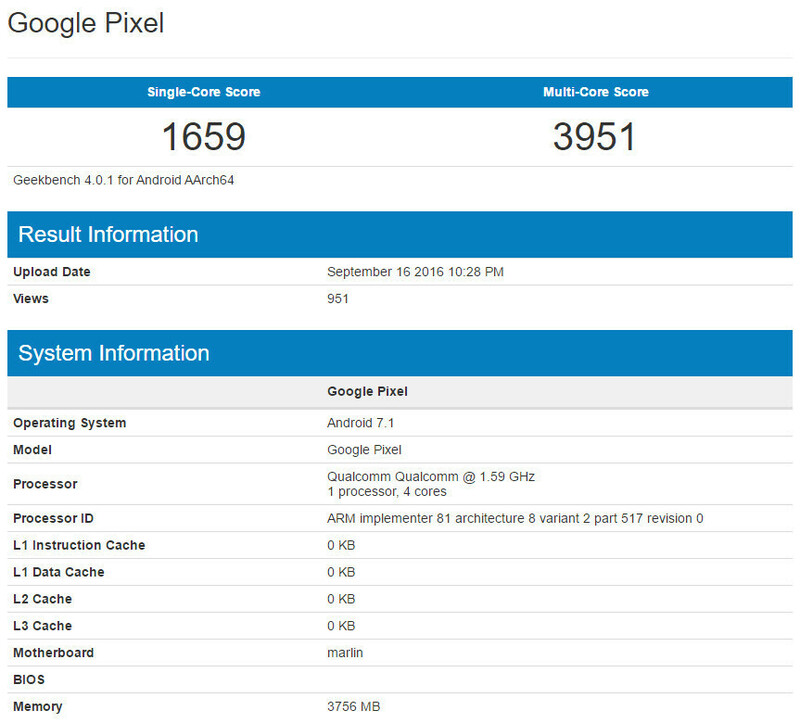 If you've been following our news, then you already know that this is not the first time that the Pixel XL shows up at Geekbench. Once again, the listing confirms that the Pixel XL will pack 4GB of RAM. Also, for the first time, it mentions the smartphone will ship with Android 7.1 Nougat right out of the box. The new iteration is supposed to bring a few new features into the mix (Google Daydream VR support), along with some improvements and bug fixes. Unfortunately, there aren't any new information about the phone's chipset. Previous rumors suggest both Pixel smartphones will be powered by Qualcomm's Snapdragon 821 processor, while other claim they will come with Snapdragon 820 CPUs on board. What we do know is the Pixel XL's CPU features 4 cores clocked at 1.59GHz. It remains to be seen which SoC Google will adopt for its new Pixel family, but either way they should be powerful enough to be included among the this year's flagship smartphones. It's also worth mentioning that the standard Pixel model will come with a 5.2-inch display, whereas the Pixel XL will sport a slightly larger 5.5-inch display. Google is expected to announce both the Pixel and Pixel XL smartphones on October 4. In fact, they might be available for pre-order on the same day, if we are to believe previous claims. The title reads "Google Pixel XL spotted in benchmak with Android 7.1 Nougat, 4GB RAM". But the picture reads "Google Pixel". That it does.... yet where is says Motherboard, it also says "Marlin".... interesting, Yes? No? Wow that score is nothing compared to Iphone 7.....damn it. I still be getting it but still. I was thinking the same thing, and yet, my year old Nexus still works amazingly well and it also comes with the world's best mobile OS, so there's that. Your old Nexus runs WebOS? Cool! I actually know very little of Web OS. I'll have to educate myself tonight. Any source links you think would be enlightening would be appreciated... If not then I'll resort to Google/Youtube. webOS was fantastic. Apple and Google both borrowed from it. The letdown was the hardware and the failure to really penetrate the market, leading to a quick collapse. I grabbed three TouchPads in that fire sale. I think BB10 was much the same. Great OS, lackluster hardware, and eventual collapse. Not exact right, HP stop the launch of their webOS tablet at the very last minute. Their tablet and brochure are already in departmental store. I actually visited their booth the day before. Which is why its one of the great mystery to me! Why invest on the mobile OS but to give it up before launching their first webOS product? LG bought it up just for their TV which is a waste. Not many developer would one to develop an app for just a small segment of the TV market. Don't bother, it's a dead and buried OS. I know stock android is pretty smooth on weaker hardware but those single cores are weak for a flagship. Yeah it'll probably be smooth but other performance tasks will be slower. It's not underclocked. That's how a normal 820's little cluster is clocked at 1.6 GHz. I don't understand why can't you accept that that's what a normal 820 scores. That would be wrong my friend. The 2 lower clocked cores have the same architecture, but they aren't the same. You know about silicon lottery. The architecture being the same doesn't mean that they are the same. Those 2 cores are weak because they can't clock as high because of yield issues. Whatever you say, those 4 cores aren't equal in hardware, only on paper. Wow... I read an article on Android authority about this SoC and they got it wrong. You are correct my friend, it's indeed 2 LP and 2 HP cores. It does explain a lot this score. But do wonder what it would score when the 2 HP's cores are active. I think you are confused. The 820 does use all 4 of the cores. This is an issue with geekbench because it only reports the frequency of the slowest core for some reason. You can see it in the result of the exynos 8890: https://browser.primatelabs.com/v4/cpu/464225 It reports the speed as 1898 MHz but we know that the big cores run at 2.4-2.7 GHz. It's just an issue since it doesn't play well with big.LITTLE. I'm not going to pretend to know anything about SoC's and what these numbers mean. Are these numbers good? Will the RAM help with overall performance, especially if the rumored 821 processor is on board? They're meh......but it doesn't really matter because all flagship phones are way faster than they need to be now. Ok. So it should multi-task and do the basic things well then. Especially with no carrier bloat. Is that fair to say? Pretty fair. My Nexus 6P has a 1270 single core and 3028 multi-core scores. The things runs silky smooth despite having a lower score than the Pixel, and a significantly lower score than the new iPhone 7. If you're still rocking the Droid Turbo then the Pixel should be a significant upgrade though I'm sure your current phone is still performing well. Ok. Thanks. My Turbo is still running well. The battery doesn't last as long as it used to but the phone still does what I need it to do. I almost bought the 6P but I waited...and waited..lolol. The Pixel will be my first Nex....hmmmm....actually this will be everyone's first Pixel phone. Can't wait to see the actual unveiling.